This cute bunny closely guards this blanket! An adorable gift idea. SIZES: Bunny height 15 cm approx. Blanket: 100 x 75 cm. Star print blanket for super-soft cuddles. Supplied in a box for a lovely gift idea. 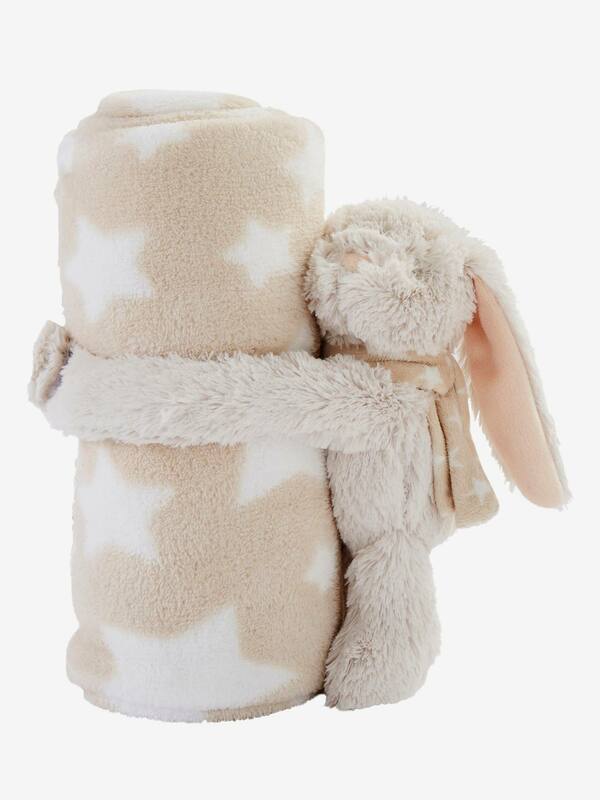 Soft toy and blanket in soft 100% polyester plush. Whether your baby is snuggling down in their cot for a nap or you are heading out with them in the pram on a cold winter’s day, you’ll want to ensure they are cosy and warm. A baby blanket is the perfect solution as it can be used in the house or on the go. Our baby blankets are super soft for ultimate comfort and some have a hood too. We have a wide range of colours and designs to fit in with your baby’s nursery, and accessories including a safari theme.